Details of an incoming Samsung SSD have been leaked via the company's Japanese website, which apparently accidentally put up a product page for the 750 EVO solid-state drive before swiftly pulling it down. Not before the good folks over at Tom's Hardware spotted and translated the details, though, before spilling the beans on what we can expect with this drive. The Samsung 750 EVO uses the Samsung MGX controller and the tech site theorises that it employs 2D planar NAND flash, given that 3D V-NAND wasn't mentioned at all in the product details – and you'd certainly assume it would be if it was being used. 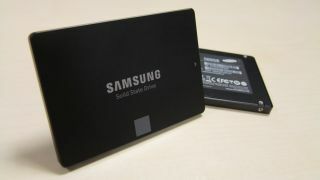 (Said 3D V-NAND, or vertical NAND, was employed in the likes of the Samsung 850 EVO, pictured above). The core specs (of the 120GB model) include sequential read and write speeds of 540MB/s and 520MB/s respectively, with random reads (QD32) coming in at 94,000 IOPS and random writes at 88,000 IOPS. It's also worth noting that this will be pitched as a budget drive, with a three-year warranty, although exactly how affordable it will be remains to be seen. As for capacities, 120GB and 250GB models were shown on the website prior to being pulled (although the link to the latter didn't work, so all the info is taken from the former). And on the security front, AES 256-bit FDE encryption is supported along with other standards. Samsung's 750 EVO should be launching pretty soon as you would expect given the false start with the website posting, and it could well be out before the end of the month.